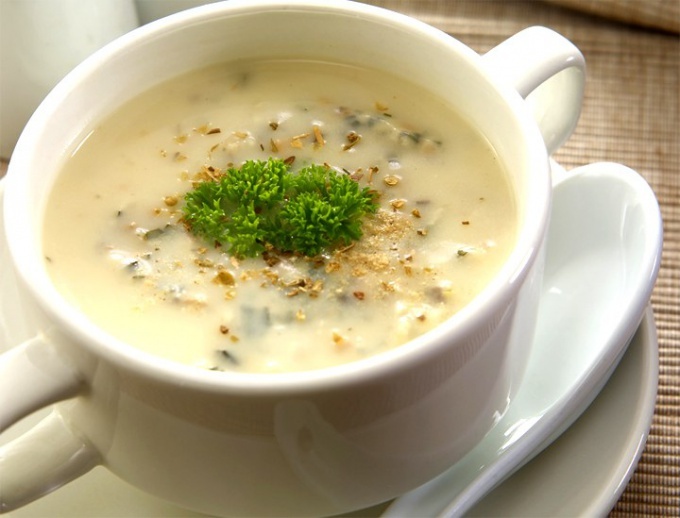 Flavorful mushroom soup-mashed potatoes become even sweeter if their season with heavy cream. This dish is a culinary classic that does not require special skills or exquisite delicacies. Many Housewives to taste puree of mushrooms and because of the obvious time – saving cooking such dishes rarely takes more than 20-30 minutes. - 125 ml cream 35% fat. In a large saucepan over medium heat, melt 1 tablespoon of butter. Put the chopped onion and lightly fry it for 3-5 minutes until soft. Mushrooms wipe with a damp towel and slice thin. Together with the thyme, add them to the onions, season with salt and pepper. Cook, stirring regularly, for 5-7 minutes. Put another tablespoon of butter and when it has melted, add the flour and fry for a further 2-3 minutes until a nutty smell. Pour in warm chicken broth, bring soup to a boil and simmer another 10 minutes. Preroute the soup. If you want the soup had a few slices of whole mushrooms for beauty, remove them for a few minutes before you begin to blend the soup. Pour the soup, cream, lightly whip it benidrom and warm over medium heat for 5 minutes. If you want to cook a silky cream soup, pureed just wipe the mass through a fine sieve and then add the cream. The classic soup is served in deep soup bowls with croutons – slices of fried white bread. - ½ Cup of chopped parsley. Prepare the mushrooms by wiping them with a damp towel. Do not wash mushrooms under running water so they do not absorb excess moisture. Separate the cap from the legs. Slice the legs, caps cut into thin slices across. Heat 2 tablespoons of olive oil in a wide, deep saucepan and saute the legs of mushrooms, diced carrots, onions and a sprig of thyme, seasoning with pepper and salt. Fry for 10-15 minutes, until the carrots are soft. Pour 6 cups of water, bring to boil and cook on medium heat for about 20 minutes. At this time, in another pan, heat the remaining oil and fry it sliced leek and mushroom caps. Add the flour and fry for another 5-7 minutes. Pour in wine, stir. Strain the broth from the first saucepan, combine it with a mixture of mushrooms, leeks and flour. Cook, stirring, for another 10 minutes. Purruja, add cream as needed and season with salt and pepper and serve with fresh parsley.